Participation in Undergraduate Research (Biological Science 199) is strongly encouraged for all majors in Ecology and Evolutionary Biology. Students enrolled in Bio. Sci. 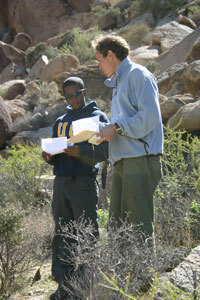 199 engage in laboratory or field research under the direction of individual professors. One to five credits may be taken per quarter, and the course may be repeated for credit. In consultation with their faculty sponsor, students develop a research topic, and prepare an abstract which must be filed with the. Descriptions of research conducted by faculty and requirements for individual labs are available at the website maintained by the Biological Sciences Student Affairs. Students enrolled in Bio. Sci. 199 are strongly encouraged to participate in the Excellence in Research Program which involves preparation of a paper and a poster, and an oral presentation to faculty. Students awarded Excellence in Research will have their papers published in the School of Biological Sciences Journal Of Undergraduate Research In The Biological Sciences. In many labs, students coauthor papers based on their research that appear in scientific journals. Participation in Bio. Sci. 199 gives students the opportunity to directly participate in research, and interact extensively with faculty. Research experience is especially valuable for students with interests in graduate school or professional programs because it provides insight into approaches essential in these disciplines. Students engaged in research also have the opportunity to interact with other students with similar interests and career goals.